Geothermal energy has become a new hope for deceleration of climate change just only 10 years ago. The possibilities offered by this source of energy at that moment seemed perfect: it was inexhaustible, not dependent on weather conditions and worked around the clock. Geothermal energy has been determined as a hidden champion among the energy sources of the future. However, the first failures had a dramatic effect, and the risks associated with conducting intelligence, in particular, made investors indecisive. This is precisely about the risk of costly drilling in place, but without finding a sufficient amount of thermal water or required subsoil temperatures for the economic implementation of the project. And the question arises: geothermal energy and GeoTEC – is the past century or a promising future? What is the potential of geothermal energy on our planet? Let’s examine step by step, from how it was, is and will be. A lot of contemporaries will be interested in the fact that the oldest SPA-center in the form of a stone basin, which takes its water from hot springs, is located in China and was probably built in the III century BC. But the real pioneers were the ancient Romans. For example, in Pompeii, geothermal energy was used at the beginning for heating buildings and heating water long before the Chinese did it in the VII-VI centuries B.C. The first “hot springs” health resort in Europe, was founded in 1326 in Belgium, and the first industrial use of geothermal energy began in the late 18th century in Italy. The steam coming from the natural vents (as well as from the drilled), was used to remove boric acid from the hot pools, which are now known as the Larderello fields. 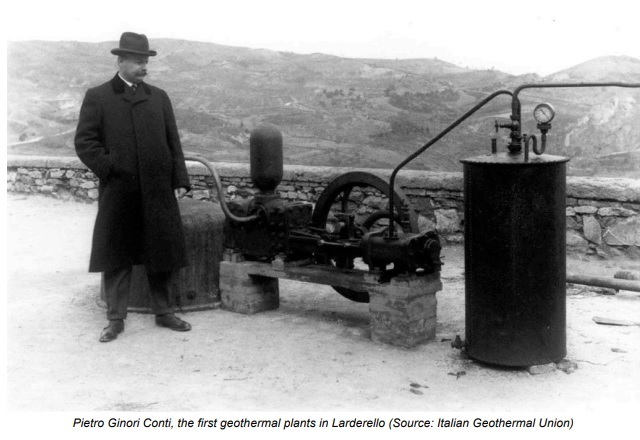 Italian scientist Piero Dzinori Conti in 1904 invented the first geothermal power plant in which steam was used for energy production (photo 1). Photo 1. Piero Dzinori Conti, the first GeoTEC in Larderello, Italy. Source: Archives of the Italian Geothermal Association. With the help of experiment mentioned above, the first geothermal power plant with a capacity of 250 kilowatts was launched in 1922, America. And already in the 1960s, the first large geothermal power plant in San Francisco that produced 11 megawatts of electricity was put into operation. More than 60 geothermal power plants are currently operating in the United States at 18 stations. When the oil crisis began in 1973, many countries began to seek renewable energy sources, that is why by the 1980 geothermal heat pumps began to gain popularity, which made it possible to reduce heating and cooling costs. As time went on, there were noticeable climatic changes – and governments of different countries joined their efforts to solve global problems. One of the steps was Japan’s Kyoto Protocol, signed in 1997, which set emission targets for developed countries and provided investment and technology transfer to developing countries. This protocol has been ratified by 184 countries. Geothermal energy is used for various spheres and purposes, let’s consider some of them below (Fig. 1). Fig. 1. 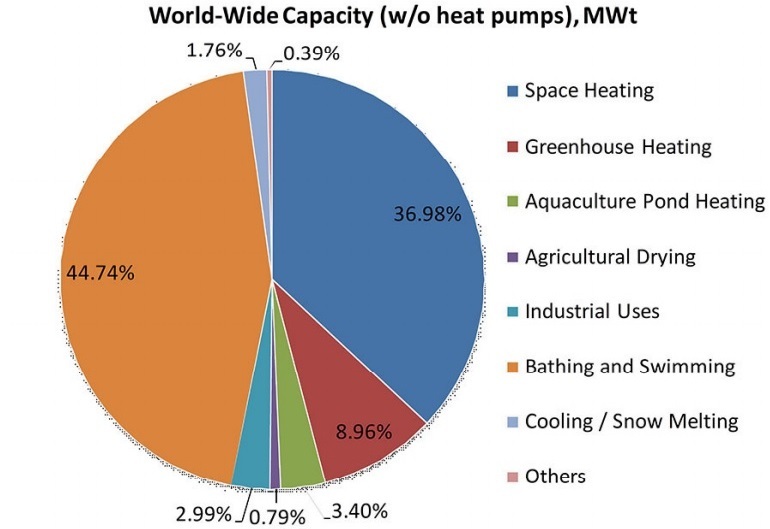 The use of geothermal energy in the world without geothermal heat pumps, in % of the total installed capacity (MW). Data for 2015. Source: John W. Lund, Rugger Bertani, Tonya L. Boyd. Worldwide Geothermal Energy Utilization, 2015. Geothermal heat pumps. Geothermal (ground) heat pumps have the highest energy consumption (55.30%) and installed capacity (70.95%) in the world. According to research data, in 2000, such pumps were used by 26 countries, and in 2015 there are already 48. The leaders in installed units are the United States, China, Sweden, Germany and France. Heating of premises. 89% of annual energy consumption falls on central heating (28 countries). Among the leaders are China, Iceland, Turkey, France and Germany, while Turkey, the USA, Italy, Slovakia and Russia are the main users in the individual heating sector (Figure 2). Fig. 2. Significant contribution of geothermal energy direct use in the economy of the country. Source: John W. Lund, Rugger Bertani, and Tonya L. Boyd. Worldwide Geothermal Energy Utilization, 2015. Heating of greenhouses and soil. Active member countries: Turkey, Russia, Hungary, China and the Netherlands. Drying of agricultural crops. Fifteen countries use geothermal energy for drying various grain, vegetable and fruit crops. For example: Iceland – for drying algae; USA – onions; Serbia – wheat and other cereals; El Salvador, Guatemala and Mexico – fruit; New Zealand – alfalfa; Mexico, New Zealand and Romania – wood. Heat used for industrial purposes. Most often there is round-the-clock energy consumption. For example: water and carbonated drinks (Bulgaria, Serbia and the USA), pasteurization of milk (Romania and New Zealand), leather industry (Serbia and Slovenia), pulp and paper processing (New Zealand), iodine and salt extraction (Vietnam) etc. Melting snow and ice. Most of these projects are in Iceland, Argentina, Japan and the United States, and to a small extent in Poland and Slovenia. It is estimated that 2.5 million square meters of road surface is heated all over the world, most of which are in Iceland (74%). In some parts of Iceland, hot water is used from geothermal power plants under roads and sidewalks to help the ice melt. Argentina uses a geothermal steam for melting snow on the highway in the Andes. Tourism. Almost every country has SPA centers and resorts, which have heated pools with geothermal water. More than 70 countries use geothermal energy for this purpose, but most of all – China, Japan, Turkey, Brazil and Mexico. Other use. Thirteen countries use this energy for husbandry services, spirulina growing, desalination and sterilization of bottles. In New Zealand – for irrigation and protection against freezing geothermal tourist park. Geothermal technologies are considered by many scientists as a potential leader in the transition to a carbon-free society. It is not accidentally that in 2017, the Global Geothermal Alliance, a coalition of 38 countries that joined together to strengthen the role of geothermal energy in the international arena, was created at the KS-21 in Paris. In the last three years, the first five leading countries of the geothermal installed power have changed a bit (Fig. 3, 4). Fig. 3. 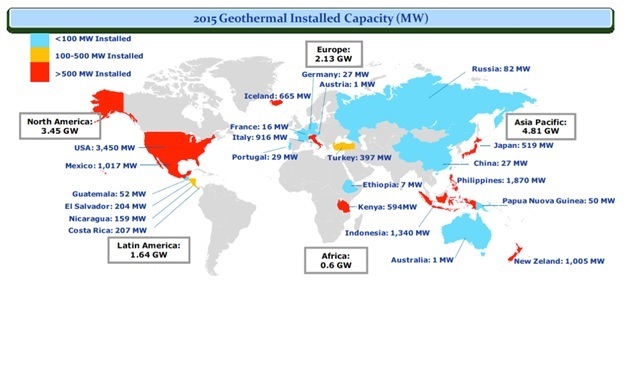 Installed capacity worldwide (12.64 GW), data for 2015. * Note: Turkey and Russia are included in Europe. Source: Bertani R., Geothermal Power Generation in the World 2010-2014 Update Report. Proceedings World Geothermal Congress 2015 Melbourne, Australia, 19-25 April 2015. Today, the position of leader in the production of geothermal electricity is given to the United States. Indonesia overtook the Philippines and took second place. Although the Philippine government is predicting a doubling of renewable energy potential by 2030, much of it will come from geothermal energy, which promotes to the construction of new geothermal power plants in the country. In the autumn of 2018, new geothermal power plants were launched in Turkey and New Zealand – it was the impetus for these countries to hit the top five leaders (Figure 4). At present, the total world power is 14.37 GW. Although the United States is still the largest geothermal country, but limited development activities lead to the fact, that the countries, like Indonesia and Turkey are becoming more attractive to investors. Fig. 4. TOP-10 geothermal leaders. 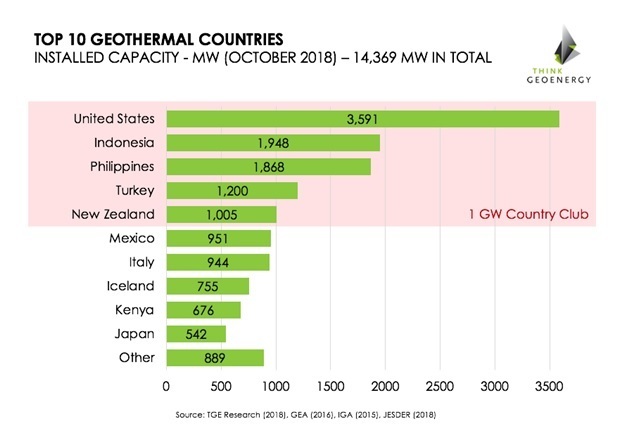 Source: Global geothermal capacity reaches 14.37 GW - Top 10 Geothermal Countries, Oct 2018, online edition ThinkGeoenergy. Geysers Complex 1.52 GW, California, USA. The largest geothermal field in the world, it includes 22 geothermal power plants. 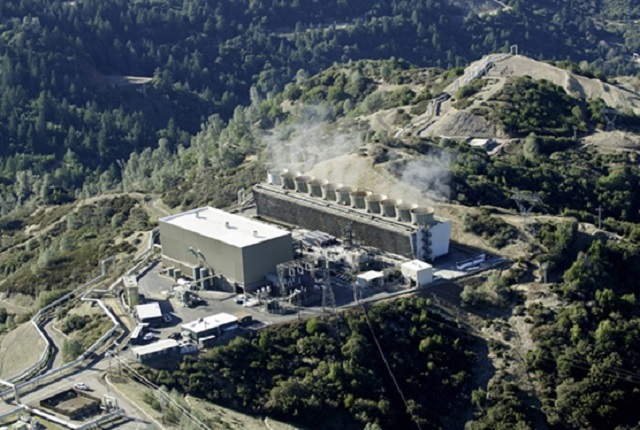 Geysers provides power to several California counties. Photo 2. Complex Geysers, USA. Source: online edition of Energy Boom - Geothermal Energy. 2. Complex Lardarello, capacity 770 MW, Italy. It consists of 34 stations. In fact, 10% of global geothermal energy is produced by this single complex, which is also one of the oldest in the world. 3. Geothermal power plant Cerro Prieto, capacity 720 MW, Mexico. This is a large complex consisting of several geothermal power plants located in the Mexican region of Lower California. Photo 4. Cerro Prieto, Mexico. Source: Online edition The Discourse, Growing pains: The black footprint of Cerro Prieto, Apr'16. 4. Makiling-Banahaw Complex, 460 MW capacity, Philippines. Created by Chevron Geothermal Philippine Holdings, Inc. Commercial production at this plant was started in 1979, when two blocks of 55 MW capacity started to work. Later, in 1984, on three other power plants were installed six blocks of 55 MW capacity. Further expansion of the complex occurred when in 1994 six binary units of the lower cycle with a capacity of 15.73 MW were installed. 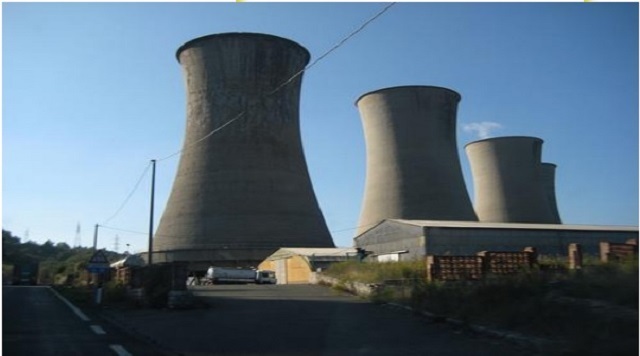 In subsequent years, other power units were opened, with the current capacity of the complex – 460 MW. Photo 5. Makiling-Banahaw Complex, Philippines. Source: Online edition of ParcolNews - Financing geothermal development in the Philippines, Dec'17. 5. 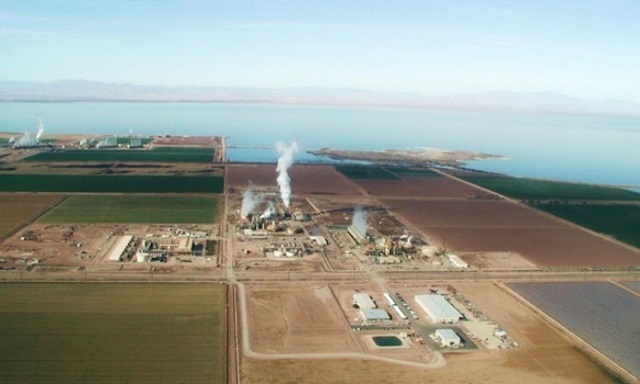 CalEnergy-Salton Sea, capacity 340 MW, California, USA. The facility covers a large area, which has 10 stations. The first unit of this complex has has begun to operate since 1982, and the latter has been put into operation since 2000. Photo 6. CalEnergy, California. Source: ThinkGeoEnergy Online Edition - CalEnergy to invest up to $ 1billion in improvements to geothermal plants, Aug'15. According to a study by the US government, the global base of geothermal resources is greater than gas, oil, coal and uranium taken together. 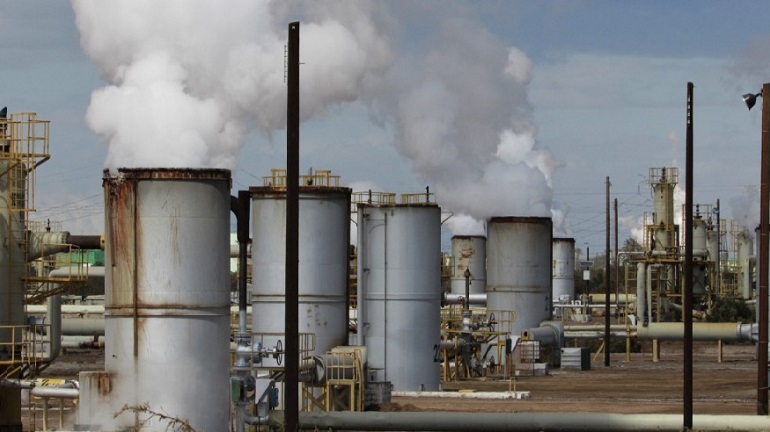 Scientists predict that by 2050, US geothermal energy will provide 10% of the country’s energy. At the same time, other researchers are of the opinion that geothermal energy is a limited resource, although geothermal activity can usually range from 5,000 to 1 000 000 years, which qualifies it as a renewable resource. According to IEA forecasts, global geothermal industry will be about 18 GW by 2023 (Fig. 5). Fig.5. Forecast growth of geothermal energy in 2018-2023 years. 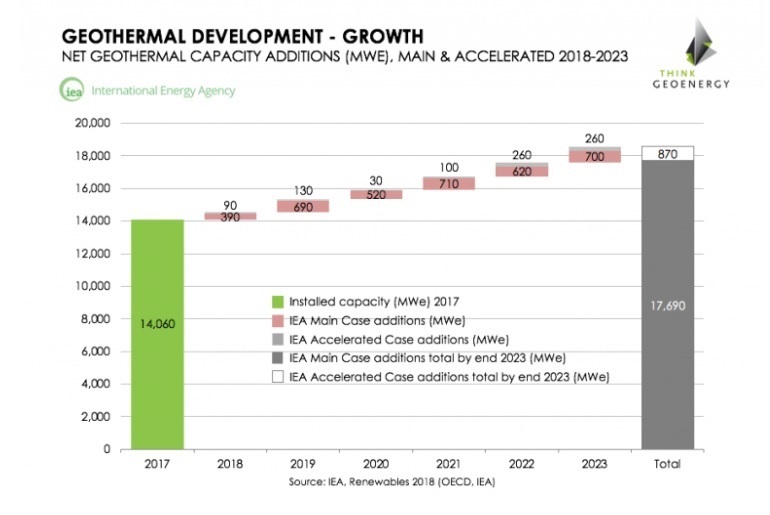 Source: IEA predicts geothermal growth of 3,600 to 4,500 MW 2018-2023, an online edition of ThinkGeoEnergy. For example, Britain is even considering building the world’s longest power connector between Great Britain and Iceland, which would supply more renewable energy to 1.6 million British homes without geothermal heat pumps. In addition, it is planned to build the first commercial geothermal power plant in Cornwall, UK, if all the necessary funds are received. This should not be surprising as some countries are profiting from the presence of geothermal energy on a larger scale. The most famous example is Iceland, whose electricity is 100% stable and uses wind energy, hydropower and, most of all, geothermal energy. In early January 2019, the government of Canada announced that it will provide substantial funding for the country’s first geothermal power plant. The list of countries that are planning to continue investing in geothermal energy and the construction of geothermal power plants is quite large. There is a positive investment climate in this renewable source. The figures speak for themselves – geothermal energy is a promising future.